The release of Bambi in 1942 marked the end of an era at the Walt Disney Studios. America had entered World War II and Disney had lost many of its animators who were drafted into service. The US government contracted the studio into making propaganda films, educational shorts, and extending goodwill relations to South America. After Bambi, there wouldn’t be another true full-length animated release until Cinderella eight years later. 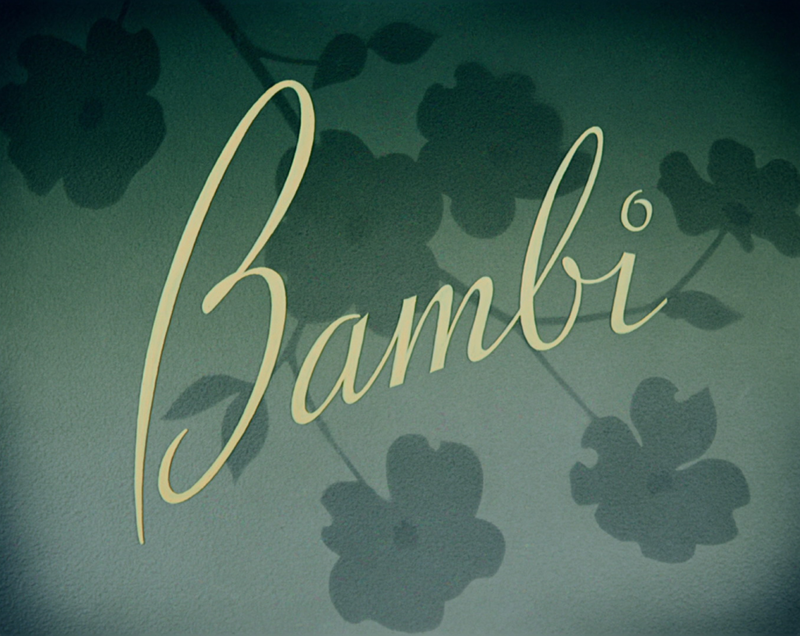 In many ways, Bambi was the ultimate culmination of all the animated films that preceded it from the innovative use of the multiplane camera in Snow White, to the rich, animated detail of Pinocchio, to the avant-garde blend of music with imagery in Fantasia, and the intimate character story of Dumbo. In fact, this may end up being one of my shorter reviews and that’s only because there are very few synonyms for the word “perfect” in the English language. 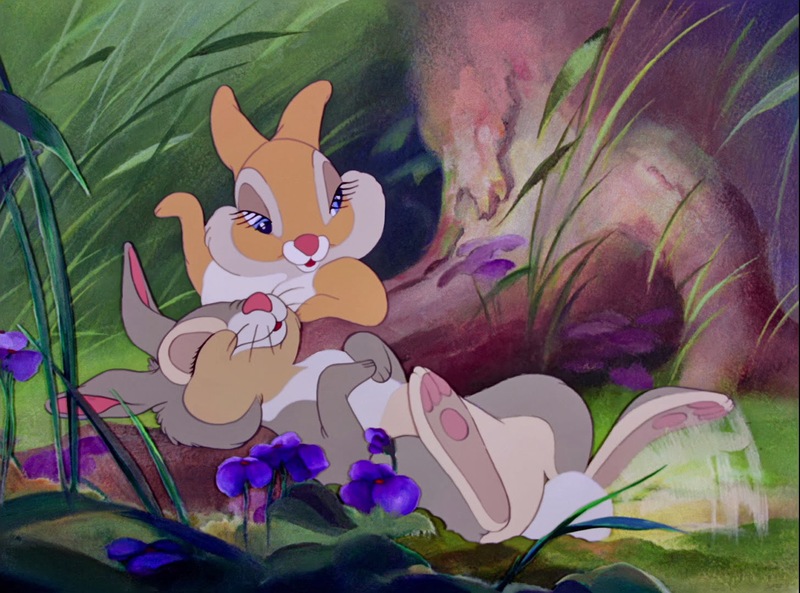 Plus, I don’t want to get on Thumper’s bad side. 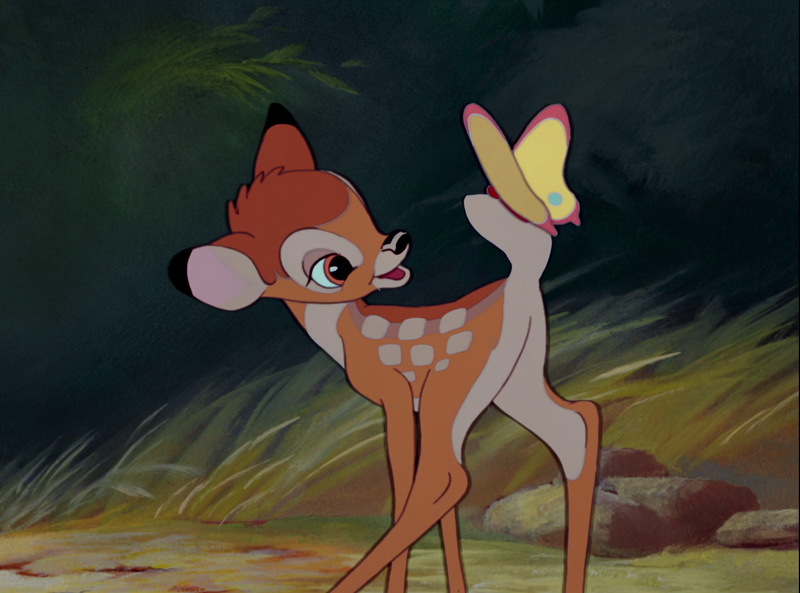 Bambi is one of the most impressive entries in the Disney canon. Although it’s often not as recognized as some of the other Disney movies (such as anything involving a princess), it nevertheless stands as one of the greatest triumphs in animated history. 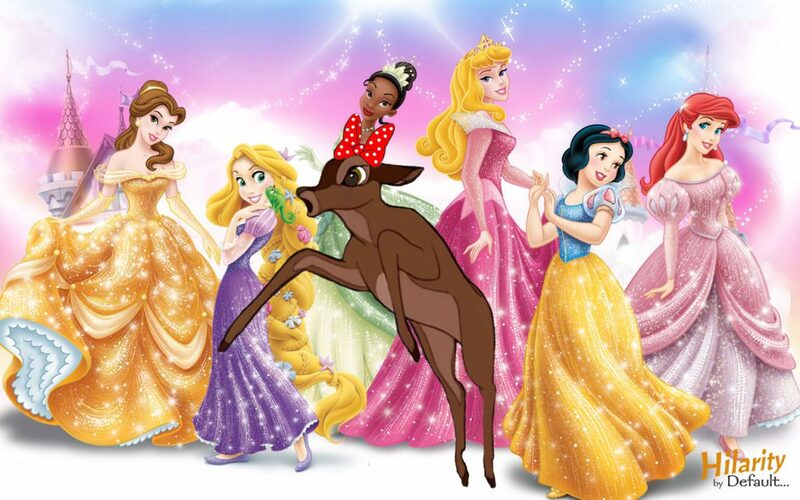 Although to be fair, Faline technically is a princess since she mates with Bambi, the prince of the forest, but something tells me that she wouldn’t quite fit in with the rest of the Disney princess franchise. Disney’s version is fairly faithful to Felix Salten’s novel, Bambi, A Life in the Woods, albeit far less depressing and grim. Salten’s Bambi practically reaches Shakespearean levels of character deaths. If audiences found the killing of Bambi’s mother dramatic, a truly faithful rendition of the book would’ve been far more traumatic. Disney’s Bambi is a film that matures at the same pace as its character. It begins with the innocent cuteness of a baby animal first experiencing the many wonders around him as the world’s dangers subtly creep in as the story unfolds. When his mother dies, he loses this innocence and the film advances to adulthood with him. At this point, a more honest and menacing tone develops save for an amusing scene where Bambi and his friends becomes “twitterpated” and fall in love. Thumper, you lucky twitterpated beast! The film allows its audience to grow to care for Bambi and his forest friends in a safe haven before it brutally casts them into a veritable world where simple errors in judgement can cost lives. One of the most terrifying scenes in the movie is another character death far more gratuitous than the fate of Bambi’s mother. A pheasant fleeing from hunters begins to panic and in her terror tries to fly to safety only to be shot down dead on-screen. 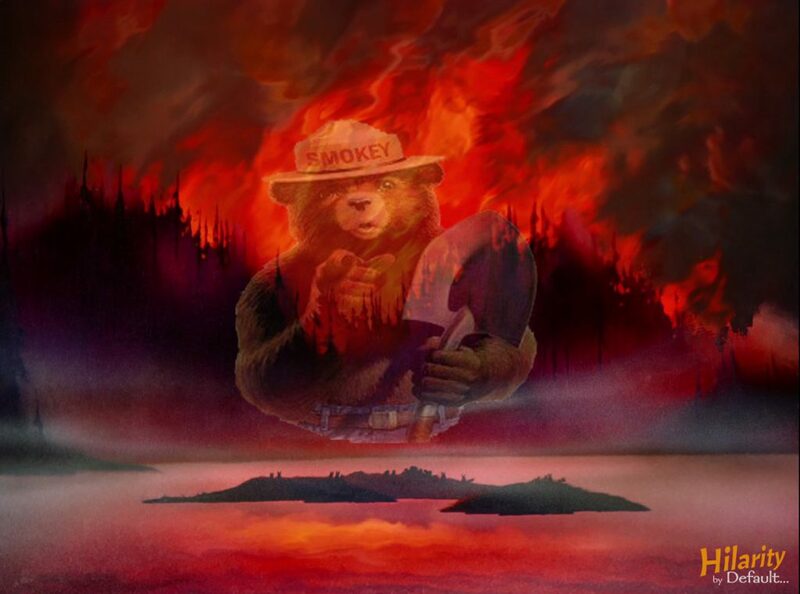 There is no fairy dust or deus ex machina that intervenes to save the day. These characters are fighting to survive. Unlike Dumbo, where heartstrings were pulled in the young elephant’s plight to get reunited with his mother, Bambi does not offer this type of solace. This is a world with deadly consequences which invests us in Bambi’s story on a primal level. His survival and ultimate protection of his mate earns him the happy ending and his place as the great prince of the forest. With the birth of his twin fawns, the story ends on a hopeful level in that despite the utter savagery of nature (or mankind), life will continue to strive forward. In a time where millions were losing their lives in the viciousness of war, there could be no more relevant message. Much like Dumbo, it is very easy to become invested in the character of Bambi. Watching his evolution from birth to adult father is fascinating and it’s practically impossible not to grow to care for him from those initial innocent romps through the forest until the heartbreaking death of his mother. As Bambi is taken in to be raised by his father, we are thankfully spared any unnecessary, cliché shenanigans of Bambi attempting to earn his father’s approval and bond with him; instead, it wisely skips ahead to Bambi’s oncoming adulthood. The narrative works well as it is and the mysterious, wise quality his father represents remains unblemished. 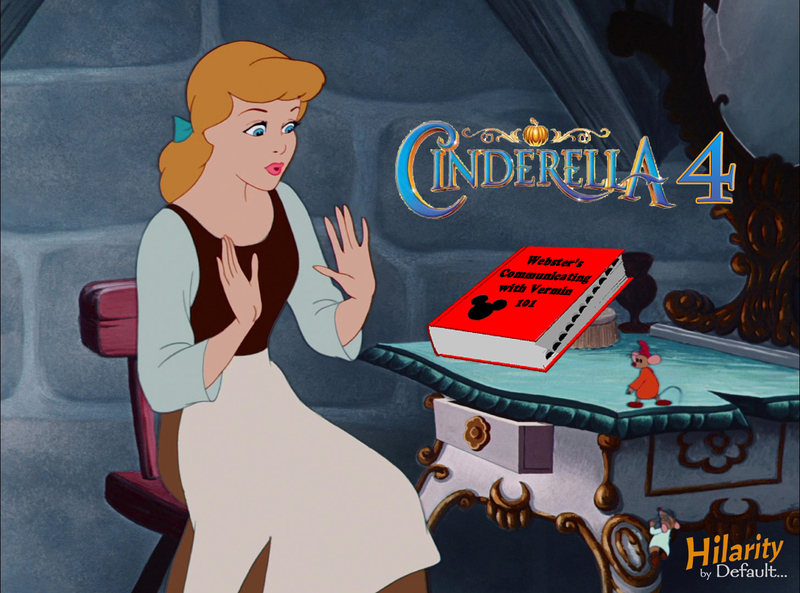 The untold story of how Cinderella learned to communicate with household vermin. 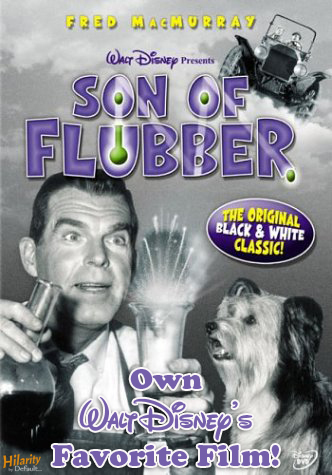 Coming soon to own directly on DVD and Blu-Ray! Bambi’s love interest, Faline, is a bit bland but she’s not really a main character until the last third of the picture. Rather, we are treated to the kinetic young Thumper and the bashful Flower the skunk. 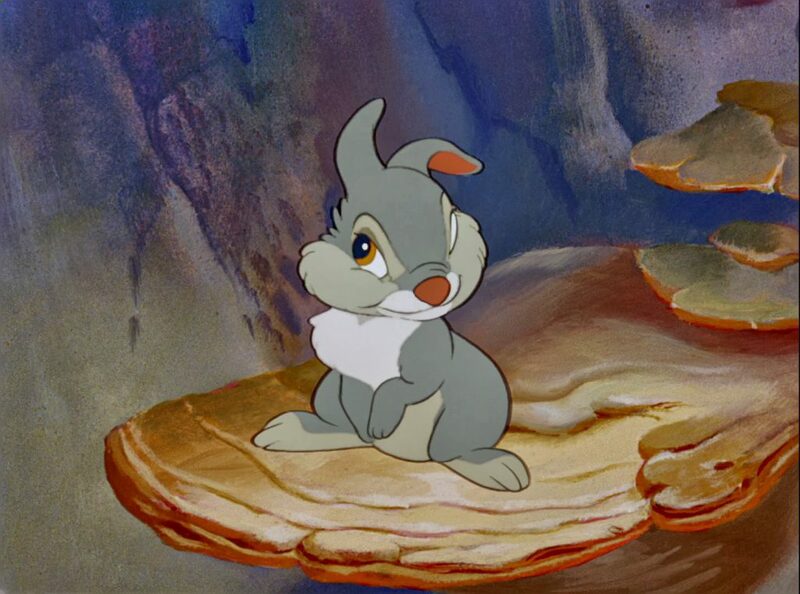 Thumper truly steals the show. 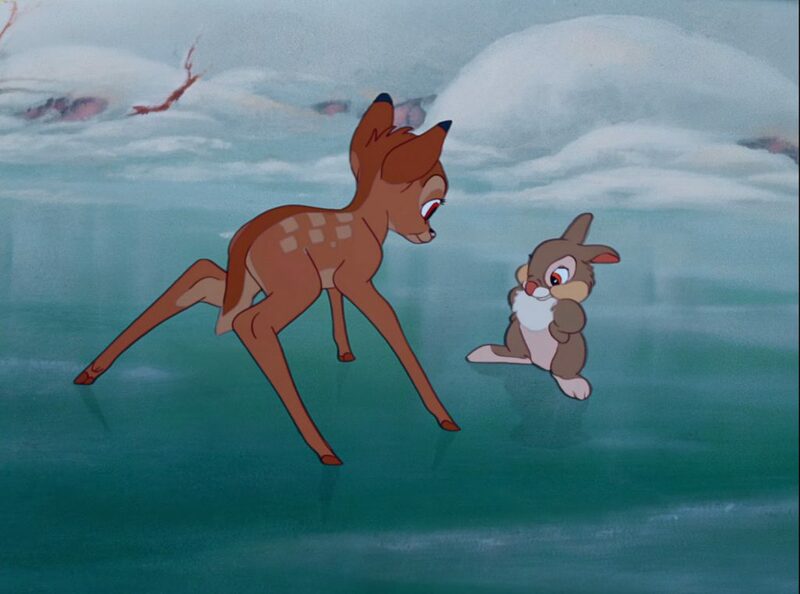 Realizing this, Disney doesn’t indulge in too many side scenes with him, as not to lose the focus from Bambi’s story, save for one delightful section where he teaches Bambi to ice skate. The villain of Bambi is the unseen terror represented by “Man.” It’s not hard to believe that this film has inspired many to herald wildlife protection and conservation. Regardless if one supports hunting or not, the vicious destruction that “Man” reins in Bambi is devastating whether through the hunt itself or a deadly campfire carelessly left unattended. Bambi is an artistic achievement. Within five years of the release of Snow White and the Seven Dwarfs, the Disney animators made leaps and bounds in the process of animal animation. It is absolutely incredible to see this evolution when the deer in Snow White are compared to Bambi‘s more comprehensive designs. Bambi evokes a wonderfully realistic atmosphere. Even the forest mist feels real. The film’s use of soft focus to diffuse the background was necessary and effective so the main characters would not get lost in the shuffle with the intricately detailed backgrounds. This technique creates a unique sense of depth that is highlighted by an amazing use of the multiplane camera for the picture’s opening scene as we pan across the forest, through streams, waterfalls, and woodland creatures. This is not meant to be in detriment of Beauty and the Beast (or the aforementioned The Lion King) but rather an example of the enormous influence Bambi has had on the Disney Studio. Although it may not have as much marketing appeal (outside of plush Thumper dolls) and a Disney theme park attraction, Bambi has left an enormous impact in terms of quality animation and storytelling. 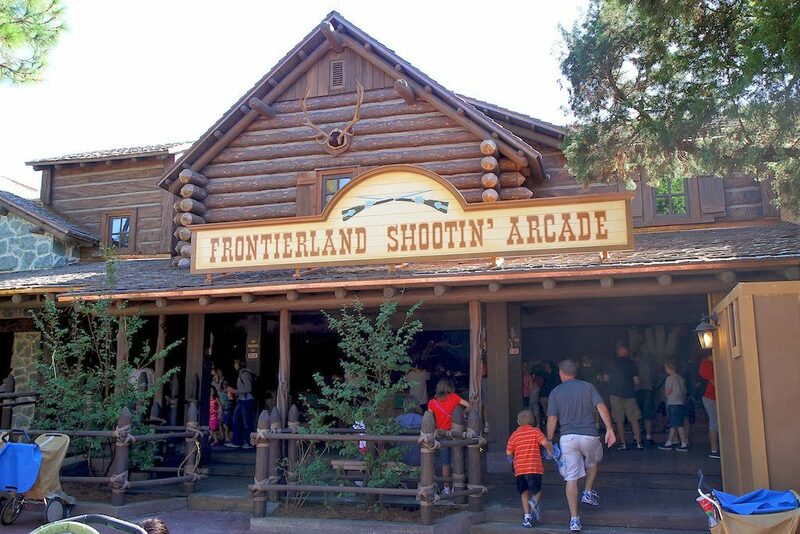 This is the closest to a Bambi attraction Disney World ever got, deer antlers and all! Following a trend that started with most of Dumbo, all of the songs in Bambi are sung by a chorus and not by the characters. 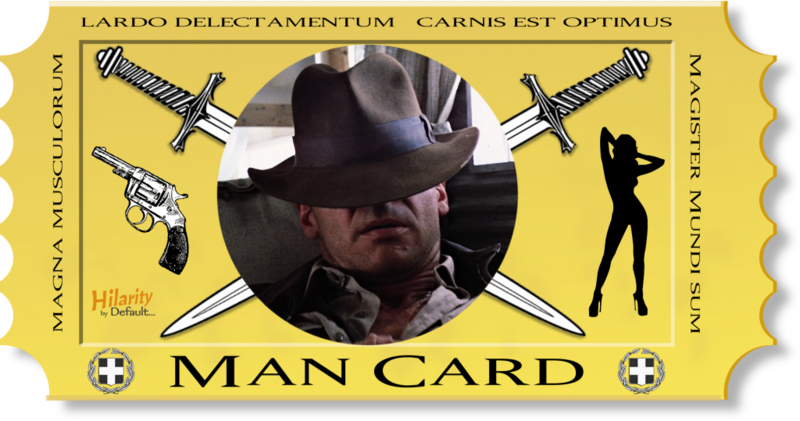 Given the more sedate tone of the film, it is entirely appropriate. The music is fantastic and the songs, although few in number, are effective and memorable. Due to the small amount of spoken dialogue in the picture, the film’s use of music was vital and what it achieved was a virtual chorus of atmosphere. The finest example is Bambi’s first sight of the adult stags gracefully galloping through the meadow. In the very same style as Fantasia, the majority of the scene is dialogue free with only its astounding score accentuating every deer’s tremendous leaps. The stand out tune is “Little April Shower.” In the vein of, but much superior to, “Song of the Roustabouts” from Dumbo, it is paired with a spectacular animated sequence of Bambi’s first experience with rain. Another highlight is “Looking for Romance (I Bring You a Song),” one of Disney’s most underrated love songs. With a much more mature aura than many of its contemporaries, the song provides a hauntingly elegant caption to Bambi and Faline’s blossoming relationship. Bambi is a masterpiece. I have to admit that it wasn’t until my most recent viewing (my first in years) that I truly began to appreciate its worth. Sure, I could easily see that the animation was superb but it wasn’t one of my most watched Disney films when I was younger. This was probably due to its subject matter and, let’s face it, at times downright depressing tone. Viewed through an adult’s eyes, on the other hand, Bambi is a grand exploration of life, providing an affirming message of nature, love, death, and, most important of all, rebirth. These themes are echoed brilliantly throughout the film whether through the death of Bambi’s mother, the changing of the seasons, or the restoration of the forest following a massive conflagration. 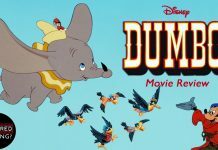 It has been labelled as Walt Disney‘s favorite of his films by many although, in all honesty, the same has been said about Dumbo and Mary Poppins (and it’s usually dependent on which film’s video release is being promoted at the time). With Disney marketing the way it is, I wouldn’t be surprised. I’d like to think that in this case it is true. I said before that there aren’t enough synonyms for the word “perfect” to describe Bambi. In my opinion, it is the best animated film Walt Disney ever produced. The flawless animation, characters, music, and heart depicted in the film are incomparable. Are there Disney films that I enjoy watching more? Sure, but few contain the soul or the artistic expression and intensity that Bambi demonstrates in abundance. The first five years of Disney’s inauguration into feature films was an output of quality that was rarely seen in such succession within the Disney Studios (or any other studio for that matter). Snow White, Pinocchio, Fantasia, Dumbo, and Bambi are the epitomic collection of Disney animated features representing a first true golden age at the studio. Only their string of successes in the fifties and the renaissance in the late eighties/early nineties can truly compare to the dynamic creative productions illustrated with these original five films. They set the tone and etched in stone a pedestal to be aspired to. 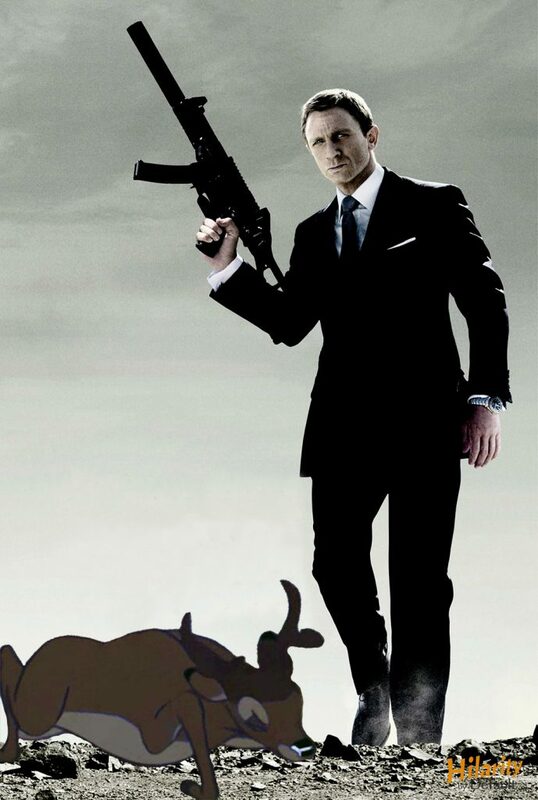 Well, maybe I can counter by pointing out that if it wasn’t for Disney’s Bambi, we probably never would have seen Bambi and Thumper’s “cameo” in the James Bond film Diamonds Are Forever. 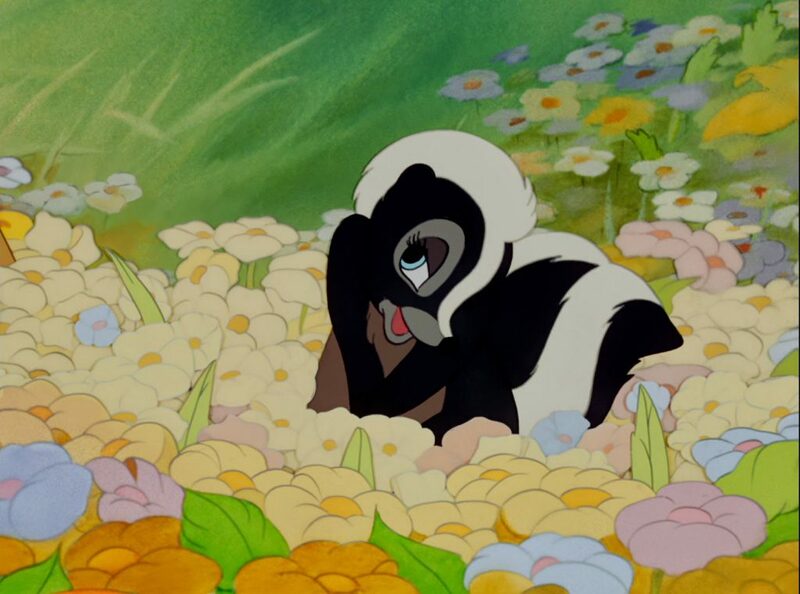 I can safely say that I’m not the only one who was shocked to find out halfway through the film that Flower the skunk is actually a male. I mean, just look at him! There are perfumes that must smell more musky than this skunk does. I can’t blame it all on ignorance. He looks and even sounds feminine throughout the beginning of the film (look at those effeminate eyelashes for goodness sakes!). When we finally meet adult Flower and he sports a husky, masculine voice, it’s quite startling. Join us next time as we take a look at Donald Duck‘s first of many trips South of the Border (not to mention his first official solo starring effort) in “Don Donald” (1937). 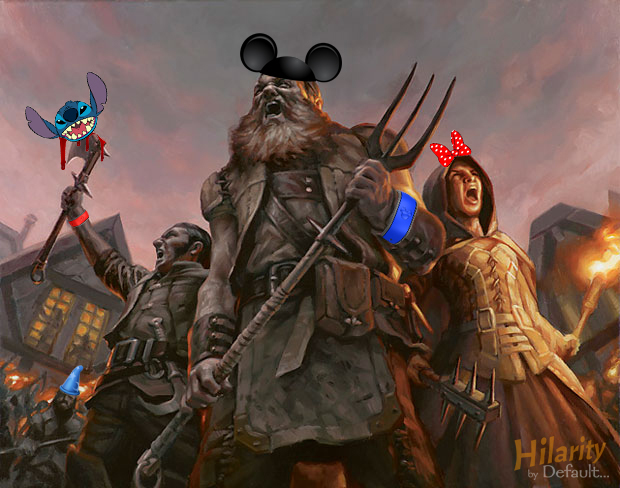 For more Default Disney, click here.